For All Kids, How Kentucky is Closing the High School Graduation Gap for Low-income Students, takes an in-depth look at the state’s campaign to bring educational equity to all students. Despite an above-average poverty level, Kentucky is a leader in closing the gap between the number of low-income and non-low-income graduates, and has one of the highest graduation rates in the country. This report looks not only at the data but also at the stories behind the numbers in case studies from the Commonwealth’s diverse regions, and highlights lessons that can benefit other states. Follow this link to read the Executive Summary. The report is by Civic Enterprises and the Everyone Graduates Center at the Center for Social Organization of Schools in the School of Education at Johns Hopkins University. Johns Hopkins University’s Everyone Graduates Center issued a report earlier this year showing that the nation has made great progress in raising high school graduation rates — mostly driven by improved outcomes for low-income and minority students… read more. Over the last decade, rising high school graduation rates have been a hope spot in America. Two million more students have graduated from high school rather than dropping out… read more. I always wanted to teach. As a child, I had teachers who inspired me to love reading and learning, and I wanted to be just like them… read more. Kentucky is a national leader in closing the graduation rate gap for low-income students… read more. Kentucky is among the nation’s leaders in closing the high school graduation gap for low-income public school students… read more. Kentucky has made rapid gains in closing the graduation gap between students from different economic backgrounds despite a poverty rate that exceeds the national average… read more. Kentucky’s high school graduation rate among highest in U.S.
Kentucky’s high school graduation rate is among the highest in the country despite a poverty rate above the national average, according to a report by the Everyone Graduates Center at the Johns Hopkins School of Education and Civic Enterprises, a Washington, D.C.-based policy center… read more. 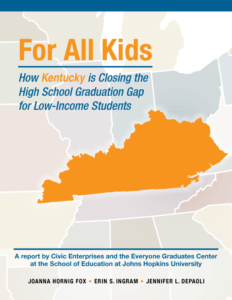 If you’re looking for a ray of optimism in this season of political gloom, check out “For all Kids: How Kentucky is closing the high school graduation gap for low-income students.” … read more.